Imagine that you’re a personal trainer and you want to make the most money possible. I’m taking the picture of Britney Spears any day of the week. Because it’s going to lead to more clients! Most people would rather be trained by the guru trainer to the stars than Joe Schmoe with a bunch of letters after his name. We grossly underestimate the raw marketing power that celebrities have. For years, companies like Weight Watchers, Guthy-Renker (Proactiv), and Bowflex have understood the influence that celebrities have over the general public’s buying decisions. However, not everyone has the luck (or pocketbook) to attain a celebrity endorsement. However, there’s a simpler, more cost-effective way to piggyback off of celebrities. Even better, you can use this strategy to write better ad creatives, landing pages, and overall marketing messages for your Display campaigns. In this blog series, we’re going to show you how some of the savviest advertisers are using celebrities to drive more clicks, leads, and sales in their Display campaigns. The 2016 election might go down as the most controversial in US history. However, very few people are talking about Hillary Clinton. It’s all Donald. Love him or hate him, most people find him more entertaining to read about than Hillary. And that fact holds true if you look at the number of advertisers who use Trump in their ads. 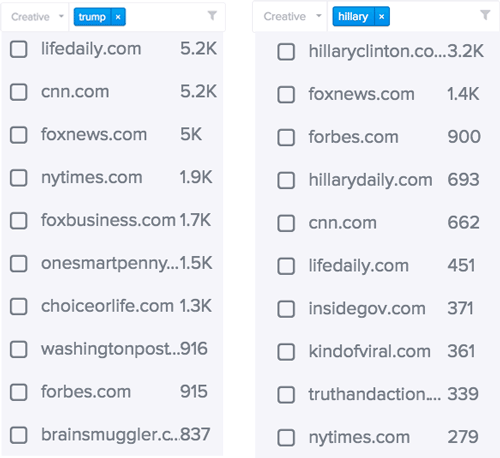 We searched all of the ad creatives in the Adbeat database for the keyword “Trump” and also for the keyword “hillary” (we could use “clinton” but she’s almost always referred to as “Hillary” in the media). What we found was astounding. The results above are the number of ad creatives Adbeat has counted with the word “trump” in them vs. the number of ad creatives with the word “hillary” in them. There is a MASSIVE difference. 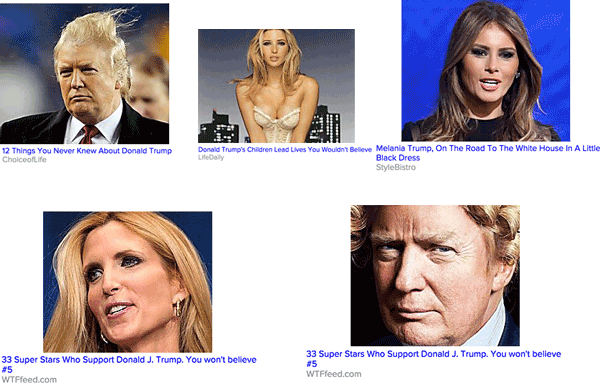 Moreover, while most of the advertisers you’ll see on each list are new sites, there are advertisers from multiple markets and niches that found a way to fit Trump into their Display strategy. Let’s see how they are doing it. We’re written before about why people love polls and quizzes. 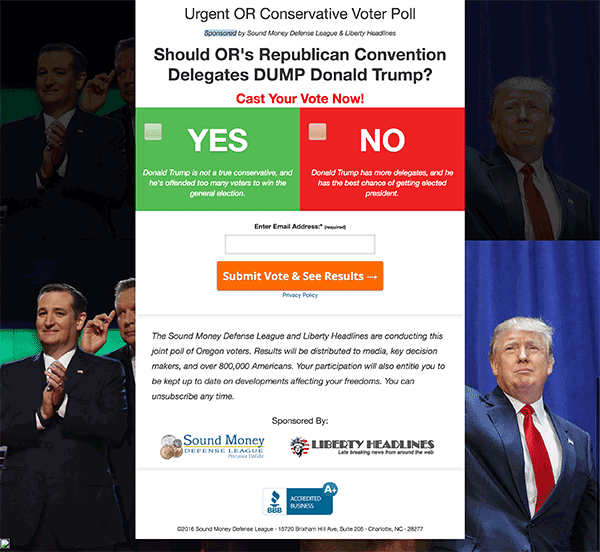 Once a prospect submits, they are sent to a page that shows the results of the poll. Then, they’ll start to see news and offers from Newsmax pop up in their email inbox. These emails may or may not be Trump-related, but Trump has already done his job of getting them to opt-in. Notice that Newsmax did not run ads featuring Ted Cruz or John Kasich. Political views aside, Ted Cruz and John Kasich are just not as newsworthy as Trump. They don’t have his celebrity power. But Newsmax isn’t the only advertiser running poll/quiz ads. 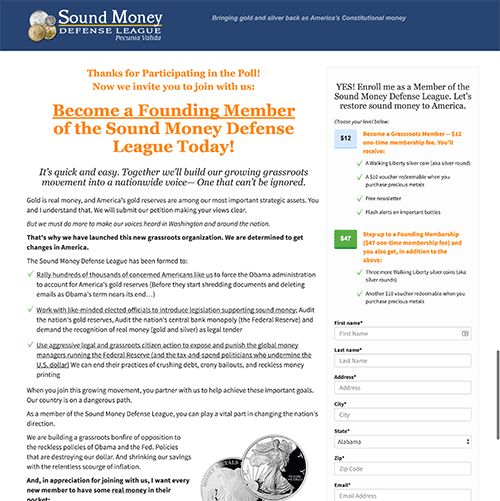 The Sound Money Defense League is an organization focused on “restoring gold and silver to its historic role as America’s constitutional money”. In a nutshell, they want the USA to return to the gold standard. This is a very clever way of using celebrity to fit the psychographics and political views of your prospects. 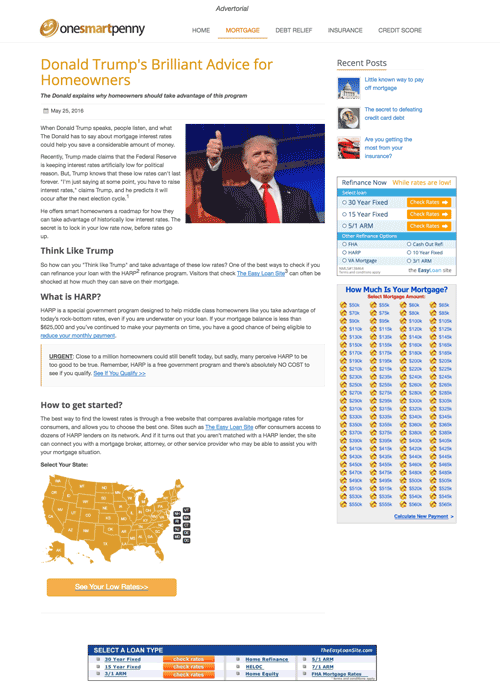 Lead generation advertisers are also using Trump in their ads by picking out a few relevant soundbites and using them in their landing page copy. This advertorial includes a quote from an interview Trump did with Bloomberg TV, where he said, “I’m just saying that at some point they’ll have to raise interest rates”. This is a very clever way of using celebrity “advice” in your marketing materials. Trump was a celebrity long before he became a presidential candidate. While he was never as famous as Justin Bieber (at least not yet), most people knew about him from the TV show celebrity apprentice, his numerous wives, children, and interesting personal life. All of this can be used for fodder for viral articles, especially now that he’s a celebrity politician. You’ve probably seen the ads below. Many of them are all over the place. There are numerous viral content sites who are promoting articles related to Trump, his children, his wives, ex-wives, and all of the crazy stuff he owns. 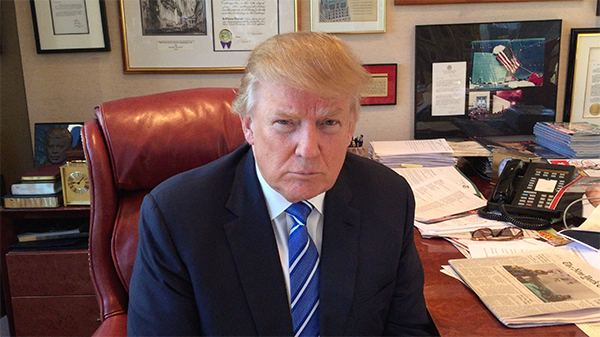 There’s no doubt that Trump is one of the most talked about celebs at the moment. Using the strategies above as inspiration, you can use his likeness (or another celebrity more relevant to your market) to see better results with your Display campaigns. Over the next few weeks, we’ll be publishing a few more blog posts that show advertisers using other celebrities as a way to drive more traffic. Stay tuned. 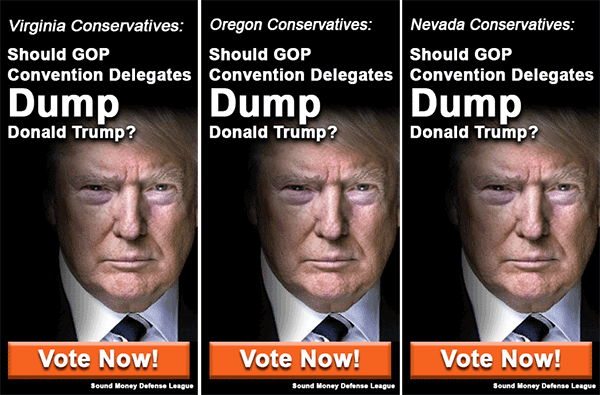 What are the legal considerations for using these images of Trump in your ads? I’m really unclear on what you can and can’t do with other people’s images like this. Can you point me to a resource to get a better understanding or can you offer any advice? Thanks!